In my work and personal life, any time there is a misunderstanding, at the root of it, is usually communication. What was said, what wasn’t said, unstated expectations, and stated frustrations. This Rotary month’s theme is World Understanding. I’d like to examine that through the lens of our mission statement and our vision statement. Mission Statement: Why we exist – our purpose. Vision Statement: What it will look like when our mission is fulfilled. Rotary’s Mission Statement: We provide service to others, promote integrity, and advance world understanding, goodwill, and peace through our fellowship of business, professional, and community leaders. Rotary’s Vision Statement: Together, we see a world where people unite and take action to create lasting change – across the globe, in our communities, and in ourselves. For me, “Be the Inspiration” was a calling to take action, and I thought a lot about how important our role is in today’s world – whether it’s across the globe, or in our back yard. A call to action to be great humans on this earth, and inspire others to do the same. At this year’s District Celebration (District Conference), we are hosting our first Rotary District 5400 Peace Institute. We will explore civility in our community, bullying, trafficking, and more. We will talk about how we create understanding, and thus peace - across the globe, in our communities, and in ourselves. I believe we could use a little more peace everywhere, and I’m hoping that you’ll join me as a Rotarian to take action, and aspire to inspire, a world that needs it. See you at the District Celebration in May! Boise's Firkin Frolic Beerfest is back for another round, and it's bigger and better than ever before! 11 of the best local breweries will be pouring LIMITED, ONE-OF-A-KIND firkins along with several other fantastic brews! Join Twin Falls After Hours and Guests during their annual Martini Tasting and Masquerade Ball! 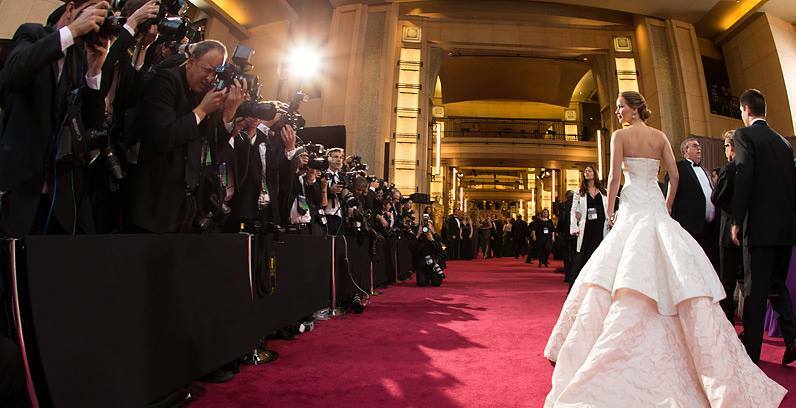 Dress for the red carpet Masquerade Ball theme and sample martinis to vote on your favorites. In addition to the fabulous martini tasting, Appetizers will be provided with a chocolate fountain for a sweet finish. Live music provided by Bret Welty will keep the crowd rocking and dancing. 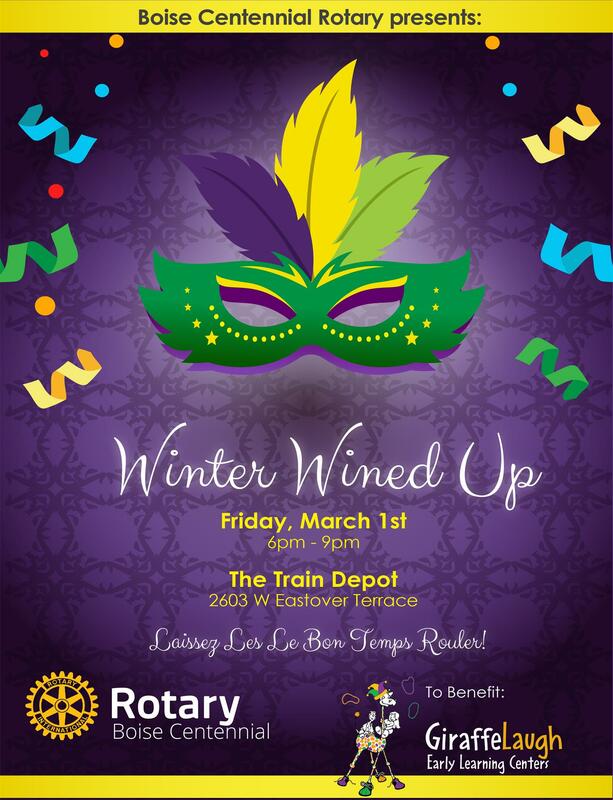 Break out your best Mardi Gras beads for the 9th annual Boise Centennial Rotary Winter Wined Up! Enjoy delicious food, local beverages and amazing company at the new and improved Wined Up as we raise funds for Giraffe Laugh Early Learning Center. 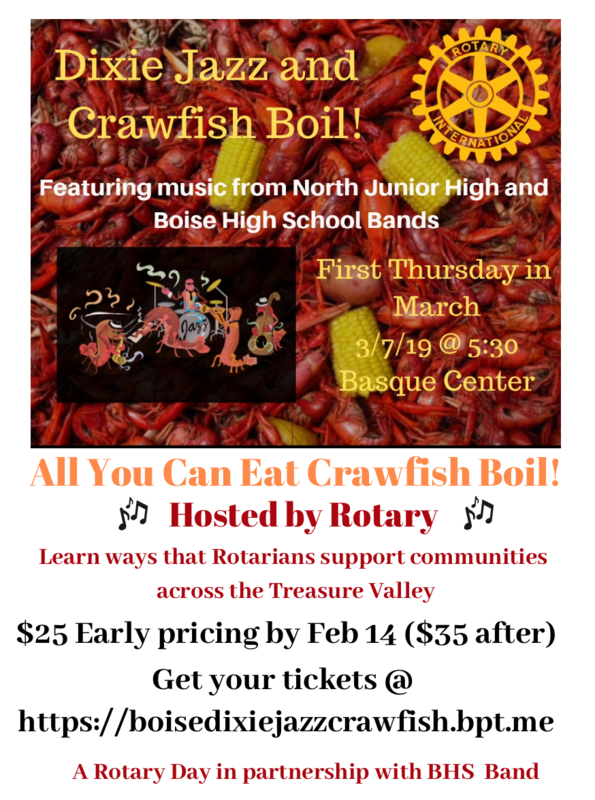 Join Boise Southwest, North Junior High and Boise High School bands for an evening of live Dixie Land Jazz and all you can eat crawfish. Crawfish will be served until it's gone with coaches available to help show how it's done! To share inspiration. Stories about who we are, and why we do what we do, so we’re inspired to go back to our communities and do more. To share innovative ideas. We always get the best ideas from our peers. To meet intriguing people. Rotarians are many things, including intriguing. 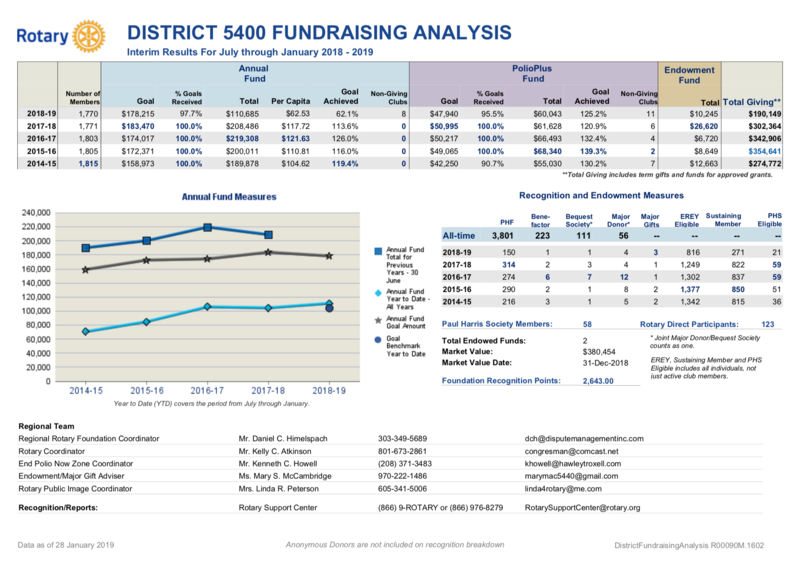 In March 2018, then President-elect Jim Boley of the McCall Payette Lakes Rotary Club met with District 5400 leaders in Burley, Idaho and started mapping out the early foundational pieces of a youth related service project during his year as Club President. After many meetings with McCall Donnelly School District Superintendent Jim Foudy, also a Rotarian, and then the formation of a committee with full board approval, the McCall Payette Lakes Rotary Club has a Youth Mentoring Program up and running. The Club, working closely with stakeholders within the school district, identified several areas where additional support and service was needed: Career and Life Skills Mentoring, Tutoring, Senior Project support and a Lunch Buddies program in the local middle school. The Montpelier Rotary Club, along with their foreign exchange student, held its annual Christmas Tree pickup, where the members drove around town and picked up trees left on the curb. After retrieval, they are hauled to the city’s brush pile. In the past the club would have a tree burn and serve hot chocolate and hot dogs, but due to the fire retardant added to the commercial trees, they had to adjust their approach. As the popularity of personally cutting trees in the National Forest is growing, they're contemplating bringing back the tree burn and treats in the future! 2018 was an exciting and challenging year for the Rotaract Club of Treasure Valley. Exciting because we officially became an established club, challenging because as with any foundational efforts in starting a club there’s a lot to figure out. With that being said, we’d like to thank those who continually support us. Thank you to our Rotary Club Sponsors, Boise Southwest, Boise Downtown, Boise Sunrise and Boise Centennial as well as Marie Baker, Katie Gaston and Jennifer Deroin. Your involvement has been imperative to our growth, sustainability and success. 2018 taught us many invaluable lessons but four continually appeared throughout the year, and we hope to utilize what we learned in 2018 to better improve Rotaract in the New Year! In January the 2019-20 Rotary Theme was announced at the International Assembly held in San Diego, California. The theme is ROTARY CONNECTS THE WORLD. This theme will inspire Rotarians to do good all EVERYWHERE. We are very fortunate to belong to such an international organization. The growth in Rotary in far away places such as Asia, India, and Africa is absolutely astounding. The finest leaders in world are inspiring clubs and districts to work hard to connect the world and bring more service and peace to people in need around the globe. Nyamphande Orphanage and Community School started in 1996, approximately 125 kilometers east of Lusaka, Zambia in Africa. Nyamphande serves the educational needs of nearly 600 children (10 % of whom have lost both parents to HIV/AIDS) as well as basic medical assistance for over 6,000 people. Originally intended to cater to the medical needs of students at Nyamphande Orphanage, the on-site Nyamphande Rural House Centre soon became a primary and essential medical resource for impoverished rural families living in the area. Local villagers, children, and other community members have relied on the Centre for treatment and management of everything from common colds and ailments to treatment for HIV/AIDS and/or TB. Wise leaders continuously pursue growth and development as a form of lifelong learning. Wise leaders are very creative and visionary in their approach toward life. Wise leaders have a keen awareness about their place in the bigger scheme of things. They combine a big passion and a big purpose with a “right-sized” ego. Wise leaders have exceptional relationship and communication skills. They find human connections to be deeply satisfying. The Four-Way Test of the things we think say or do. It is something that most of us repeat every Rotary meeting, it sounds good and it has great value. It is something that I use in my life and repeat to others when decisions need to be made. However, maybe the true value of the Four-Way Test never became as clear to me as it did last year. "ONTARIO — Amber Campbell has been volunteering in local communities since she was in middle school and says volunteer work and serving the community is part of who she is. But Campbell says there are many people around the area who help their communities, and are as much deserving as she is to be recognized for their service. 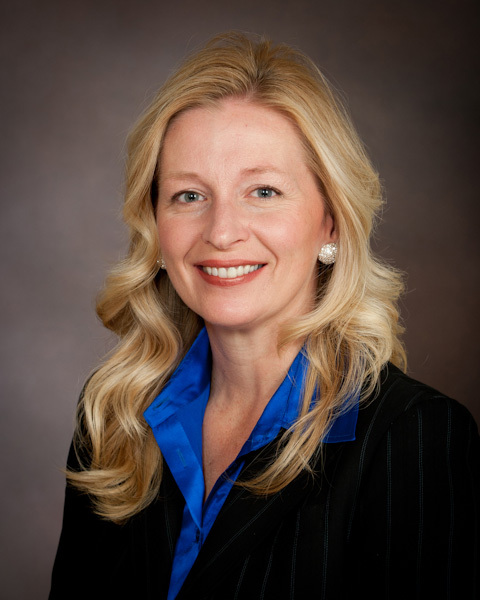 Campbell will be honored as the Ontario Area Chamber of Commerce Woman of the Year at its annual Honor Banquet on Jan. 11. I just returned from the 2019 International Assembly in San Diego. Each year about 500 District Governor Elects (DGEs) meet together at AI to learn their duties. Projects are planned, seminars are held, and speakers inspire. 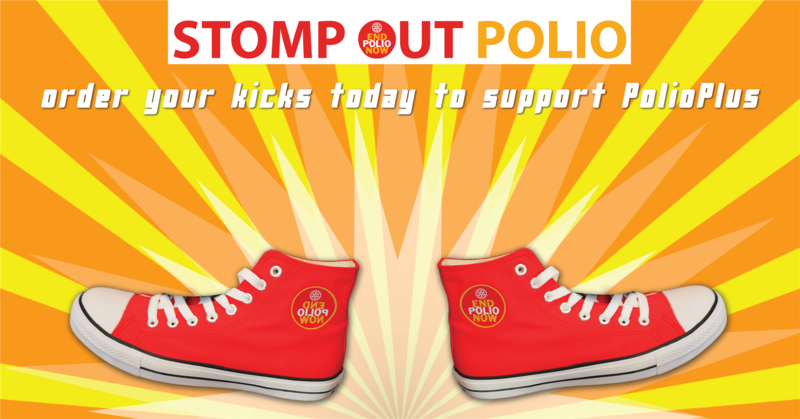 One thing I noticed that made me very proud is that there were SEVERAL attendees who, like myself, were sporting red high-top shoes proudly branded with the the logo, “Stop Out Polio”. "As a Volunteer Attorney with Family Advocates, Jim has served twelve children in the last two years alone. Jim consistently goes above and beyond to answer Guardian ad Litem questions and regularly communicates updates in a clear and concise manner so GALs know what they can expect from the legal aspect of each case. Jim recently undertook the drafting of a new motion for our program, which ultimately resulted in enhanced advocacy for a family group. Without his expertise and dedication, it may not have been possible to serve this family in the best way possible. Through his years with CASA, Jim has referred colleagues to volunteer with our CASA program and provides guidance and mentorship when possible. The Rotary leadership camp will be held August 1-4 on the CSI campus in Twin Falls. The RYLA website has all the information along with a brochure clubs can print out to recruit students. Students can apply starting April 2nd. At RYLA 2019 we will focus on 3 key areas of leadership development, including resiliency, mindfulness, and intention. Our goal is always to develop and enhance the all ready amazing young leaders that attend RYLA through activities designed to increase emotional intelligence, personal and social awareness while building confidence. RYLA is an experience every young person can benefit from! The Paul Harris Fellow recognition was started by The Rotary Foundation in 1957 to recognize $1,000 in cumulative giving. Adjusted for inflation, $1000 in 1957 is equal to $9,103 in 2019, yet a PHF continues to be awarded for $1,000 in giving. Are you a Rotarian who might be able to give more than the suggested annual contribution of $100? Are you a Rotarian who would be willing to join the Paul Harris Society pledging $1,000 annually to Annual Fund, PolioPlus and/or an approved global grant? We started the year with 54 Paul Harris Society members in the district, and we’ve grown to 58. Our goal was to increase by 10%. Will you join us? To join, complete the form on the Paul Harris Society’s webpage (look for the JOIN button to open the form). Beginning in February, you’ll be able to edit or cancel your recurring giving through Rotary Direct by signing in to My Rotary and going to Donor Self-Service. The change is intended to make recurring giving faster, easier to manage and more secure. Your email address is your user ID at rotary.org. If you have questions or need assistance using Donor Self-Service, call the Rotary Support Center at +1-866-9Rotary (+1-866-976-8279) or email rotarydirect@rotary.org. Two new (2018) Wild Polio cases reported this week. You all know that for every $1 Rotary spends annually of your donations towards Polio eradication that the Bill and Melinda Gates Foundation gives us $2 to do more spending for ridding the world of Polio. Thanks to your generosity last year Rotary received today a fund transfer of $100 million from the Gates Foundation. Let’s continue the progress to a Polio free world! - Michael McGovern, Chair, International PolioPlus Committee.